Can you confirm these amateur observations of Cyrtodactylus tigroides? Comment Definition: A moderately sized Cyrtodactylus, snout-vent length to at least 83 mm; body slender, limbs and digits long, slender, original tail very long; one pair of enlarged postmental scales in broad contact with one another; dorsal scalation with 13 rows of keeled tubercles; 34 ventral scales across belly between ventrolateral folds; no precloacal groove, 8–9 precloacal pores separated by a diastema of 7–9 poreless scales from a series of 5–7 femoral pores on each thigh, pores present in both males and females. 7–8 broad basal lamellae and 12–15 narrow distal lamellae beneath 4th toe of pes. Median subcaudal scales enlarged to form broad transverse plates. Dorsal pattern of yellowish-cream bands on a brown background, dorsum of head yellowish with symmetrical brown markings (after BAUER et al. 2003). 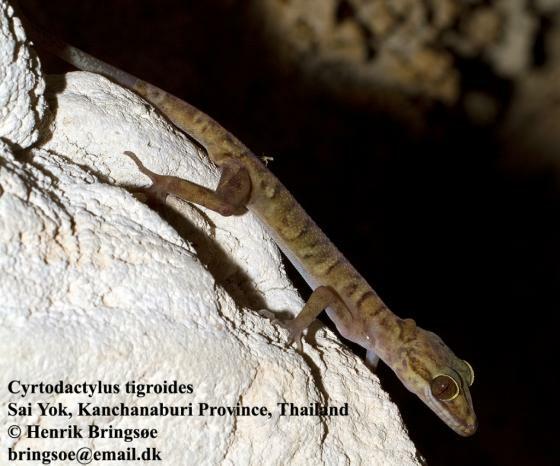 Cyrtodactylus tigroides is similar in size, habitus, and, to a lesser extent, color to only two other Thai members of the genus: C. sumonthai and an undescribed new species (see BAUER et al. 2003). It may easily be distinguished from both of these both by details of color and by the configuration of the precloacal and femoral pores. Etymology Named after the Latin word “tigris” (tiger) and the suffix “–oides” (resembling) and is in reference to the bold banding pattern of this species. 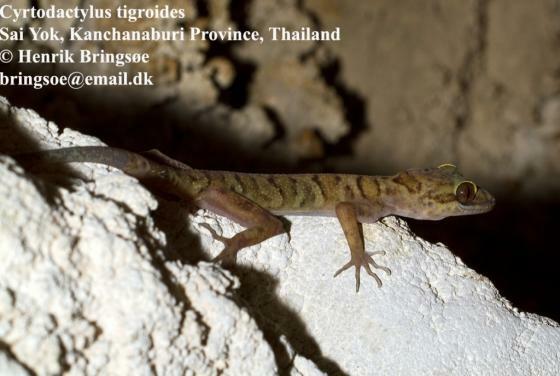 The epithet tigris is preoccupied in Cyrtodactylus by Gecko tigris Tytler a subjective synonym of C. rubidus (Blyth).